Add Colours with The Maybelline Colossal Kohl "Jewelled Jade" ..!! I am here again with another Maybelline product review. If you are following my blog from a long time,then you must have an idea about how much I love the brand Maybelline. Most of the stuffs in my stash are from Maybelline. This one is the only drug store brand on which I can believe undoubtedly. They have such amazing quality stuffs with affordable price tag which attracts my eyes each time to shop more and more. 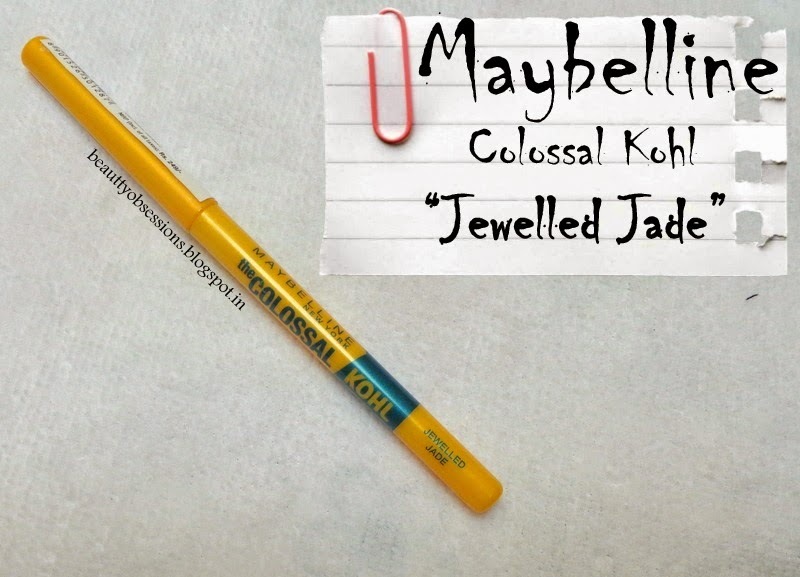 They have always comes with some exciting new launches and in my previous post I have reviewed on the new launch Colossal Liner which is in a pen form and has scored 5/5 , to read that review CLICK HERE . Besides that they have also launched three beautiful shades of kohls and today I will review one of these which is named as Jewelled Jade ..
* Infused with nourishing ingredients and vitamin E, this kajal gives soothing effect to your eyes. * Smooth texture of the kajal glides effortlessly onto eyes. * Color stays for minimum 12 hours without fading. * It features a unique tip which makes application easy and comfortable. My Opinion: The packaging is very much similar to the colossal kajal but the outer cardboard cover is missing this time. Hence there is no information regarding the product ,only shade name and price are mentioned on the pencil. It is a twisted pencil with very tightly locked cap which makes it travel friendly and there is no wastage of product due to the twisted form. The shade Jewelled Jade is a beautiful peacock blue colour with very fine shimmers in it . The shimmer particles are not visible from distance actually. It has a soft and smooth texture which allows to glides smoothly on eye lids . The kohl has less pigmentation capacity , I need 3-4 swipes to bring the actual colour intensity. You have to apply it light handed as the tip is really delicate. The staying power is maximum 5-6 hours on me in this hot weather but during winter I think it would be more than this. The kohls are smudge proof and water proof as well. I need a good cleanser / makeup remover to remove its all traces. It looks equally beautiful on upper eyelids and lower lids.You can also apply little broadly on the upper eye lids followed by a black liner closer to the lash line to create a colored dramatic look. The shade looks beautiful on all skin tones. Have you tried any of these three kohls from Maybelline ?? Which one is your favourite..??? P.S- Product was sent by PR , but my opinion is honest and unbiased..